It’s back and oh god is it back as we know it. 23 years we’ve waited for a reboot of this genre defining, seminal title. It’s brash, it’s crass, it’s ludicrously, unashamedly ultra-violent and has a story so cliched you’d be forgiven for trying to skip each narrative (but you can’t, so just sit back and breathe). And it is utterly delightful. 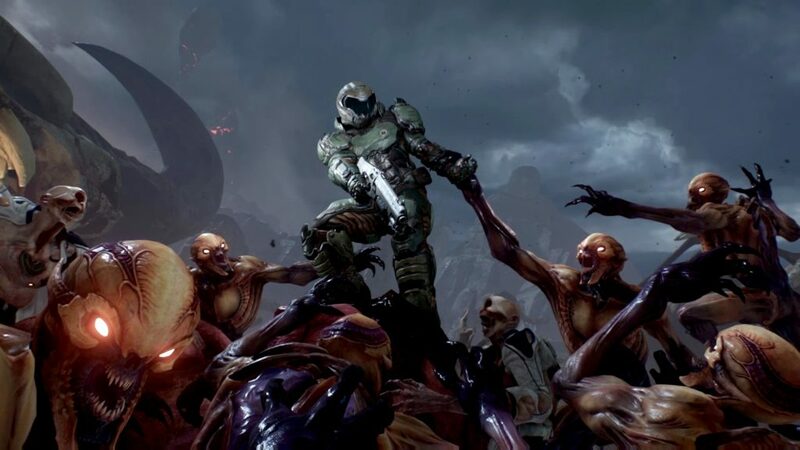 Incredibly, id, under the banner of Bethesda, have managed to create a game so visceral and intense that it can only justifiably wear the Doom banner. And with pride. I’ve only played the single player campaign, but it’s all I’m interested in at the moment and having completed it, I’m waiting to get straight back into it after writing this. The game is essentially a series of brutal ambushes interspersed with sections where you’re simply travelling to the next one. Enemy mobs are familiar to anyone with any semblance of memory for the original. Hell Barons, Imps and Cacodemons all make their welcome return, each with their own brutal collection of strategies. Level design is spacious and typically old school. In fact it’s more Serious Sam than I’d like to admit, but I’m keen to distance that from that moniker as it would be seriously doing it an injustice. The spread of weapons is very familiar with real thought having gone into the strengths of each and every one, from the double barrel shotgun to the cataclysmic BFG. But special mention has to go to the gatling gun which has to be the most rewarding firearm ever to grace a game. It really is a joyful sin to empty an entire magazine of chain gun bullets only to have a free spinning barrel and a pile of corpses everywhere. Special mention to the fury mode which is triggered right before the death of a mob. As it flashes yellow you can trigger a special melee attack which rips out jaws, pulls arms from their sockets and clean punches faces off shoulders. It’s immature fun at its greatest. Graphically it’s not great. It’s clean and efficient – at 4k, ultra settings, it runs smooth as silk and I suspect for multiplayer purposes this will be fine. But it lacks some imagination in design, with the martian bases not having had much renovation from Doom IV, but most disappointing is the lack of any true horror in hell. I’d have loved for them to have created a terrifying concept of hell. Regardless, if you’re into massively fast paced, mousefinger spamming FPS games please get a look into this. It’s brilliant fun.